The Last Sentence From “Smart People”: But what to do? Well to answer that question I began to look for an organizing system that would provide a good model to assess the likely benefit or harm of any health intervention whether it be by drugs, surgery or behavioral intervention. Was there a way to, as it were, prejudge whether a proposed treatment course would actually improve a person’s health or merely make certain surrogate markers for disease look better. In this setting examples of surrogate markers are blood pressure, cholesterol, fasting glucose and the like. These markers are measured and any improvement in them is usually deemed as evidence of health benefit. For example if some intervention makes your blood pressure go down then, for several decades, it was assumed to be good for you. We now know that many blood pressure medications cause problems that range everywhere from increasing your chance of diabetes to your chance of succumbing to certain cancers. better, feel better and live longer. If you did it by undesirable means then your blood pressure would be lower but, for linguistic symmetry’s sake, you would be uglier, feel worse and live, not longer, but shorter. Well, ask someone placed on a beta blocker for their blood pressure and many of them will tell you they sleep more poorly, their sexual capacity is reduced and they are more prone to depression. Talk about treating a surrogate rather than the patient. OK, so what kind of model will allow you to decide between different therapeutic approaches to aging and disease? There may be more than one but I came up with one that is surprisingly powerful. I want to share it with you. Kick the tires, look under the hood and I think if you give it fair consideration you will see that it reflects a better scientific model of the human medical condition as well as provides a model to both guide research at the bench science level but, more to the point of this book, it will give you a way to organize your thoughts about diet, exercise, sleep, life and love. I do not mean to imply that this mapping system will replace the arduous task of working out the molecular biology of cell wall construction and the electromechanical dimensions of cell to cell communication. But it will help you decide whether to bet your health future on some new medication being sold as the new cure for diabetes or high blood pressure. It will give you a clear picture of whether that pound lost is better lost or regained and a different pound be lost or gained instead. Let me give you a crisp example from current medical pharmacology: there is a class of drugs sold to help those who have osteoporosis, they are called bisphosphonates. They have actually been around for many years but fairly recently have been sold to improve bone density. One example, Fosamax, has been sold to millions of women worldwide. How does this drug work? Well the short version, absolutely clear enough to make my point, is that they block the natural breakdown of old bone. Well, bone is in a constant state of flux; we tear down old bone and, hopefully, make new bone with the net result that we have more mineral dense bones at any point in time; this accounts for the rapid increase in bone density when we are young. Tear down old, make new. Bisphosphonates block the tearing down of old. They do nothing about making new bone. Well if you’ve stopped making new bone holding on to old bones sounds pretty good but a reasonable person might ask why we don’t look for a drug that makes new bone and not one that preserves old bone which is known to be more fragile and prone to fracture than new bone? Well the surrogate, bone mineral density goes up with bisphosphonates so, it must be good right? Well, no not really; these drugs are associated with esophageal cancer, an increase in certain kinds of important fractures, osteonecrosis of the jaw bone- it even sounds bad- and with the net result that you only appear to be better but in fact are not. This is an example of a bad approach that The AnaCat Map would have warned you away from. As it turns out almost no one really needs them anyway. The electromechanical property of bones called the piezoelectric effect remains until great old age and when recruited- jogging doesn’t work- can make more real and brand new bone than any bisphosphonate will ever make. It involves some work but work with a host of other benefits along the way and not the standard list of side effects of bisphosphonates like esophageal cancer, fatigue, heartburn and fragile bones (!). The point for now though is that The AnaCat Map would have queried this approach and rejected it on the basis that the approach did not make new stuff but preserved or increased old stuff. Old stuff has less ‘biological power’ than new stuff. Statins are another simple case: take them and your testosterone goes down and your insulin resistance goes up, your chance of diabetes increases. You are weaker because your muscles are more frail and so on. ‘Biological power’, as I use the term is not like ethanol, but is to be understood as the intrinsic power of any biological entity. Some simple examples: for those over 65 years of age your gait- walking- speed is one of the most important predictors of your life expectancy; more statistically predictive than your blood glucose or your blood pressure. Grip strength is another one; very powerful as a tool to assess life expectancy. These two illustrations will either strike you as obvious, you go to the gym, or silly, you spend more time at the computer. I abuse your courtesy to leave it at that; probably some at the computer have a faster gait than those at the gym because they are not as sore. Let me give you some other power metrics associated with longevity: testosterone, growth hormone, VO2 max, bone mineral density and HDL maturation are examples. The more of each of these the greater your statistical chance of increased longevity. Things that lower these, cortisol is a good example, also lessen your chance of survival. 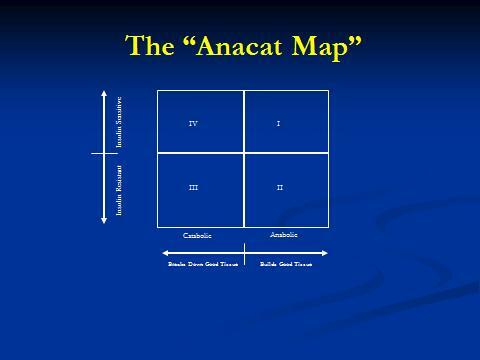 I have now outlined one axis of the AnaCat Map; to the left on an XY graph is your catabolic status and to the right is you anabolic status. It is actually a continuous line of the gradations of the value of a complex formula of these numbers from least, on the left, to the greatest on the right. For now I won’t get into the mathematics because frankly it is not as important as the graph and the simple understanding that you want to live, eat, laugh, pray, train, take meds and relax in such a way as to move you farther to the right. More detail to follow. Now look, if it is not obvious, I have a lot of backing data to explain, even defend this model of understanding health, illness and the application of the scientific method to the medical science model. For now take a look at this, if you wish think about it and its implications and I will get back to you with more detail and examples of simple ways to use the model.